On October 11, California’s governor signed a bill that requires California pharmacists to provide translations of prescription instructions to help the millions of residents with limited proficiency in English gain better access to important health care information. At a minimum, the law requires translation in the following languages: Chinese, Korean, Russian, Spanish, and Vietnamese (see news report). The law takes effect January 1, 2016. Carepoint’s partnership with Polyglot Systems’ allows California pharmacies to easily comply with this new requirement right away by activating Polyglot’s Meducation® solution within GuardianRx™. Meducation is a time-saving, innovative online tool that generates simpler, personalized medication instructions in the patient’s preferred language. Patient-specific medication instructions – drug, dose, time of day – are simplified to 5-8th grade reading level & presented in intuitive formats. 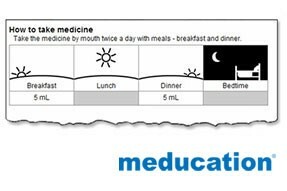 Pictograms of time of day and medication techniques convey information unambiguously. Patient-specific instructions for over 2900 medicines and 145,000 NDC codes can be generated in any of 5 fonts and 21 languages, delivered to patients either printed or on bottle labels, all from within GuardianRx™ workflow. For more information about integrating Meducation for GuardianRx™ in your pharmacy, contact our Support Team by phone at 800.774.1361 or by email at support@carepoint.com.